A high level target has arrived in Tobruk for a surprise visit, but your intel paints a conflicted picture. Could it really be the Führer, or one of his rumoured doubles? With time running out you must infiltrate the city, pick your location and decipher the crucial ‘tell’ in time. With an expansive environment, randomised clues and SEVEN different ways to take down the Grey Wolf, no two playthroughs will be the same! 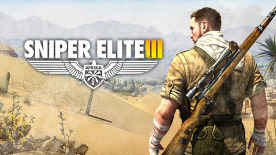 The latest chapter in the award-winning series, SNIPER ELITE 3 takes players to the unforgiving yet exotic terrain of North Africa in a savage conflict against Germany’s infamous Afrika Korps. Stalk your targets through the twisting canyons, lush oases and ancient cities of the Western Desert in the deadly rush to sabotage a Nazi super-weapons programme that could end Allied resistance for good. Use stealth, planning and execution to hunt your targets – whether human or machine. From signature long distance kills, to melee takedowns, distractions and explosive traps, you are as deadly up close as you are from afar. Award-winning gunplay – Experience celebrated rifle ballistics honed to perfection. Take account of distance, gravity, wind, even your heart rate for intensely satisfying third person combat. Expansive new environments – Stalk huge multi-route levels with multiple primary and secondary objectives than can be tackled in any order. Never play the same way twice. Real tactical choice – Adapt to any situation. Use stealth, distraction, traps and sound masking . If things go hot, use the new Relocate mechanic to slip into the shadows and start the hunt again on your own terms. Revamped human X-Ray Kill cam – The acclaimed X-Ray kill-cam is back and bolder than ever, including a detailed muscle layers, 3D mesh particles and the complete human circulatory system. New X-Ray vehicle takedowns – See vehicles disintegrate in intricate detail with X-Ray vehicle takedowns. Multi-stage destruction allows you to take out armoured cars, trucks and Tiger tanks piece-by-piece. Tense adversarial multiplayer – Five unique modes of online competitive action. Earn Medals and Ribbons as you play. Gain XP across all game modes, customise your character, weapons and loadout. Become a true Sniper Elite! Explosive co-op play – Play the entire campaign in two player online co-op, or put your teamwork to the ultimate test in two dedicated co-op modes, Overwatch and Survival. Customise your experience – Veteran or Rookie, play your way. Turn off all assistance and turn up the AI, or customise the experience to your preferred playstyle. Tweak the regularity of X-Ray kill cams, or turn them off all together. ©2014 Rebellion. The Rebellion name and logo and the Sniper Elite name and logo and the Sniper Elite Eagle are trademarks of Rebellion and may be registered trademarks in certain countries. All rights Reserved.